Once upon a time there was a big cultivated field of pumpkins on a farm, which was getting ready for the big celebration on the All Saints Day. All the pumpkins were perfect to paint, to eat, etc. They knew that it was their destiny and they were in agreement as they would be the centre of attention for a few days per year. They would tell each other how beautiful they were, and talk about their various sizes also. There was a huge pumpkin in a corner near them. The farmer had moved it because it was different to the others. It was massive, with odd lines, all faded and wrinkled. She was a sad pumkin, hiding behind her own leaves as she knew she was different and that her destiny was not the same as the other pumpkins. In spite of her size, she felt small. -“Don´t feel bad! You are very special! You are destined to make all kids in the world happly, and they will give you many surprises and you will give them happiness”. 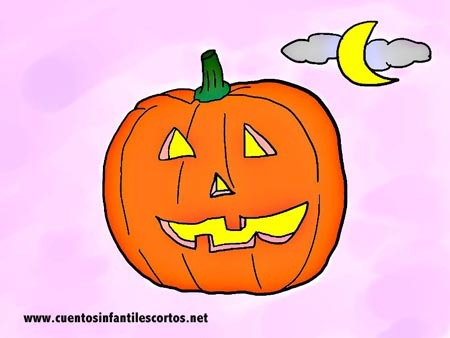 “Pumpkin, pumpkin, you will always live to give happiness”. And suddenly…surpriseeeee! The pumpkin turned into a cute and funny plastic pumpkin full of sweeties for halloween, and she was going to be present in all the homes with all the kids. Is the magic pumpkin the one you have at home?